Discussion in 'Civ4 - Rhye's and Fall of Civilization' started by dmd175, Feb 27, 2017. I picked up RFC after a 3 year hiatus. Asoka was one of the few I couldn't do before (many threads on the randomness of the UHV). Anyway, hut south of Delhi spawned a worker, and I was off to the races, following Kalle's guide but with a twist, to pursue Judaism first. I founded Judaism, Hinduism, Buddhism all in Delhi (all in there because I had only a single city - more cities seem to detract from research early). 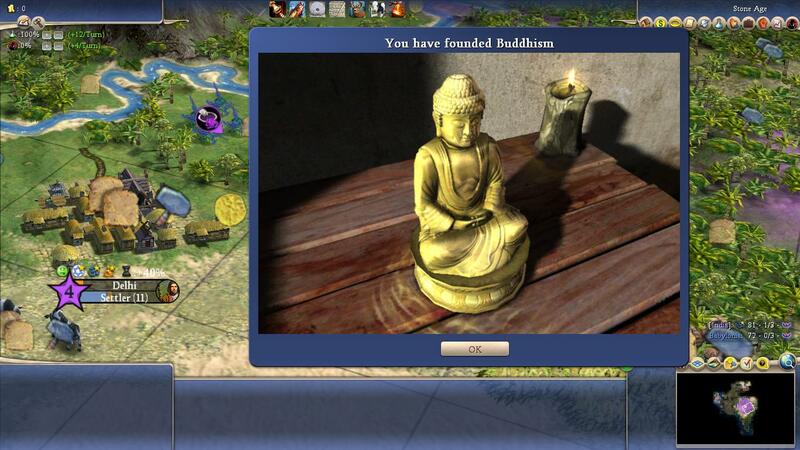 I reached the UHV, and I noted that somewhere along the line the Holy City status for Buddhism disappeared. I don't have this one shrined and so I wasn't paying close attention to the little gold star. Searching the threads I can't find this reported (only thing remotely similar is Church of Nativity sometimes in Jerusalem or Rome). Do/can the holy cities move? Obviously not in regular BTS but in RFC? If not, some bug? (I have razed a few cities in Khmer and China - so it's possible if the city moved I razed it [China I harassed since 2000 BC with a popped warrior to steal workers and DoW'd everytime I saw a settler moving, and they founded a total of two cities: Nanching I razed immediately upon settling, and then when they collapsed around 1100 AD I razed Qufu and Beijing, despite being a good city, too far away and in the red stability zone). Play Dawn of Civilization, it's much better. Did you use world builder? 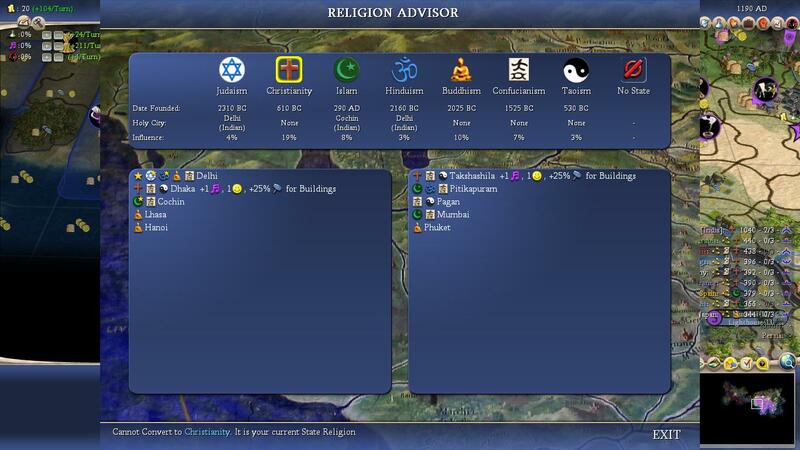 Removing a religion in any city removes the holy city.